I am so excited about today's nail art. Weird confession: I love watching animated kids movies. The characters are always so adorable and the worlds fantastical. There is always the funny side character for comedic relief and in the movie Despicable Me and it's recent sequel, the Minions serve as just that. I love those little guys! Though I am a vegetarian and haven't been to McDonald's in years, I purchased a Happy Meal for the toy. That's right, no judging! 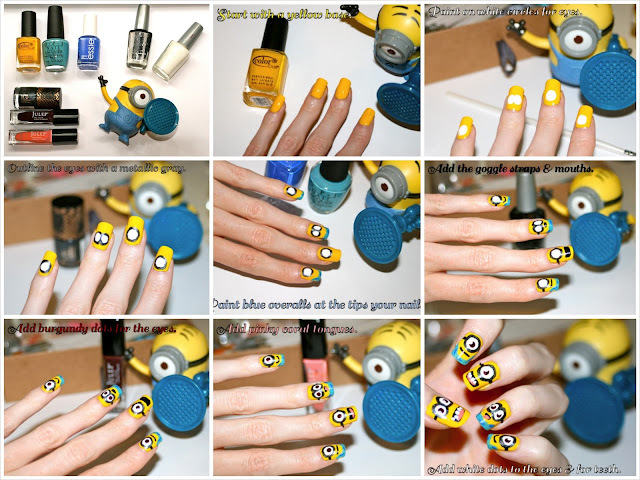 Minion nail art has been popping up all over the place, and I knew I would just have to do my own rendition. I love having these little guys on my fingers. I won't lie; it was time consuming and requires a steady hand. Perfect for doing during a TV show or movie marathon (that's how I do it...) I wasn't sure how they would turn out, but I took pictures along the way anyway. Below is a step-by-step guide to what I did to create my little minions. As for the specific colours, I used Color Club Almost Famous for the yellow, an unnamed elf polish for the gray, Wet 'n Wild French White Creme for White, OPI Can't Find My Czechbook & Essie Butler Please for the overalls, Wet 'n Wild Black Creme for the black details, Julep Coco for the burgundy eyes, and Julep Teri for the coral. Don't think I left my right hand out of the fun! Ten minions are even better. It was definitely difficult to paint with my off-hand, so it's a bit scratchier and rougher than my left. Hope you enjoyed seeing my take on the minions! Haha I didn't realize that's what it was! I can't look at it without laughing now :] I'm glad you guys liked it. I still need to see it!